After Intel's late-August Core 2 Duo launch, the first Lenovo laptop to incorporate the new processor wasn't a ThinkPad, but the humble Lenovo 3000 N100. With a starting price of $699 ($929 for the base Core 2 Duo model), the N100 line isn't exactly where you'd expect to find the latest and greatest components. Then again, there's nothing worse than seeing a well-designed laptop hobbled by subpar performance, and while the N100 we tested won't win any speed races, it zips through the typical productivity work that most budget laptop buyers are looking to do. Granted, if you need blazing performance, strong security measures, or a lengthy warranty, you should look beyond the N100 to more expensive laptops, such as the HP Compaq nc6400, the Dell Latitude D620, or Lenovo's own ThinkPad Z61t. This Core 2 Duo version of the Lenovo 3000 N100 combines decent performance with the features and connections a small-business user will need, all at a competitive price. 76% Inexpensive Lenovo delivers strong WorldBench 5 performance, but its battery life is subpar. As vendors switch over to Intel's latest notebook processor, the Core 2 Duo, you can save a few bucks on older Core Duo-equipped notebooks such as the Lenovo 3000 N100. It's got a fairly long list of desirable features: A capacious hard drive, a nice screen, plenty of USB ports, and snappy performance. On the downside, I encountered woefully bad speakers, mediocre battery life, and a slightly stiff keyboard. Also, software costs extra, further lessening the system's appeal. Lenovo include a lot of software as standard and its recovery suite is excellent for doing regular backups or restoring to factory defaults. Personally, I go straight to add/remove and get rid of most of it. The system tray is absolutely a chocker with icons and it's hard to find what's important. Although it's nice to Norton Internet Security included, I'd sooner be using AVG Anti-Virus. This notebook is a good performer in a decent chassis. Although £537.98 is for the version with integrated graphics and only 512MB of memory, this can't be far off and that's amazing value for money. Unless you are intending on being on the move a lot, this is well worth considering. 60% This dual-core portable packs in a lot for the price. 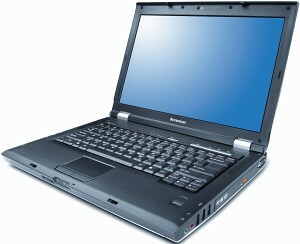 The Lenovo 3000 N100 is the latest addition to the company’s new line of Lenovo-branded notebooks. Unlike the nondescript C100 model, the N100 sports a stylish design and offers a nice 15.4-inch widescreen display. At 6.2 pounds, it’s relatively easy on the shoulders. The 1.5-inch-thick notebook’s Premium Silver finish is offset by a black wrist rest and keyboard layout. The full-sized ThinkPad-style keyboard is spacious and responsive, and the two-button touchpad maintains the same aspect ratio as the display. As with the C100, the N100 lacks a trackpoint mouse controller—an omission that is sure to disappoint loyal ThinkPad enthusiasts. The integrated speakers will fill the bill for basic sound output, but music audio quality is subpar. Lenovo 3000 N100 - UK EXCLUSIVE! The uninspiringly-named 3000 N100 is Lenovo’s first-branded dual-core laptop. The low-cost system also sports a widescreen display, FireWire, DL DVD burner, built-in camera and easy-to-use management software. The system is pitched at small business customers with a limited IT budget, and we believe it hits the spot very well. The only real disappoints are the lacklustre design and basic pointing devices. The N100 is a better system than the C100, offering good processing power, a nice set of features, and an attractive price tag. It’s no ThinkPad and a battery life of 2h 44m isn’t going to set the world on fire, but Lenovo’s first widescreen laptop will give some other big players (Dell, HP and Toshiba) a run for their money. The N100 has lots to recommend about it. From my vantage point, it looks more like a consumer notebook with the glossy screen and plastic case. A dash of the business side has been thrown in with the fingerprint reader, DVD-RAM and more extensive software bundle. I think the $64,000 question for the N100 is going to be price. If Lenovo can keep the price down for N100, it should do well. If the price starts to go too high, like over $1500, it is going to be a harder to justify the N100. At that price point there are notebooks, even Lenovo's own Z60, which will have better construction and features for the same price. It will be interesting to see when the Z60 gets Core Duoized how it stacks against the N100. Lenovo didn't make much of a splash with the 3000 C100, the first notebook to bear its name. But round two is looking a lot brighter. The sleek-looking Lenovo 3000 N100 will make a better impression on consumers, giving them good processing power, a nice set of features, and a price tag ($1,349 direct) even I can agree on. On the outside, the N100 looks a lot like the Lenovo ThinkPad Z60m. It has a silver lid that looks like the Z60m's titanium cover, but the shell is made entirely out of plastic. The N100 weighs 6.1 pounds, which isn't too heavy to tote around. The transflective 15.4-inch widescreen is excellent for images and well suited to multimedia tasks such as video and photo editing. Lenovo, the company that bought IBM's ThinkPad business last year, has developed an alternative brand of desktop PCs and laptops designed to "address the needs of small-business customers" at a cheaper starting price point than most ThinkPad models. The first two laptop offerings under the Lenovo 3000 umbrella include the superbudget C100 (starting at $599) and the slightly higher-end N100 (starting at $799--same as the ThinkPad Z60t). Our well-equipped $1,399 N100 test unit delivered a strong combination of components (including Intel's new Core Duo processor), performance, and connectivity for the price. The battery life wasn't remarkable, however, and despite the N100's low price, its one-year warranty is inferior to the three-year warranty offered with a comparably priced Dell Latitude D510. Sparmobil - Mit dem 3000 N100 bietet Lenovo ein billiges Notebook mit 15.4-Zoll-Display an. Intel Core Solo: Single core version of the Core Duo and successor of the Intel Pentium M; Because of the 65nm reduced structure width also smaller current consumption than Pentium M (maximally 27 Watts); the performance is comparable with the equivalent clocked Pentium M (somewhat faster because of a few improvements). T1300: » Further information can be found in our Comparison of Mobile Processsors. 77.11%: This rating is not convincing. The laptop is evaluated below average, this is not really a recommendation for purchase.